Defining our business helps our customers to understand what we do. While our FAQ page is full of your questions, we thought we’d get down to the nitty-gritty for you. Here is part four of our definition series. This time we thought we’d cover a favorite question. 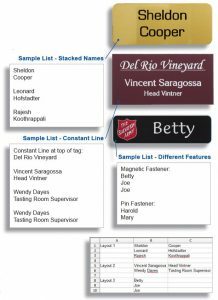 We get a lot of questions about how customers should provide their lists for their name tag orders. Hopefully, this information will clarify some of these issues. First things, first. Your list submission process. You must prepare lists to our specifications. 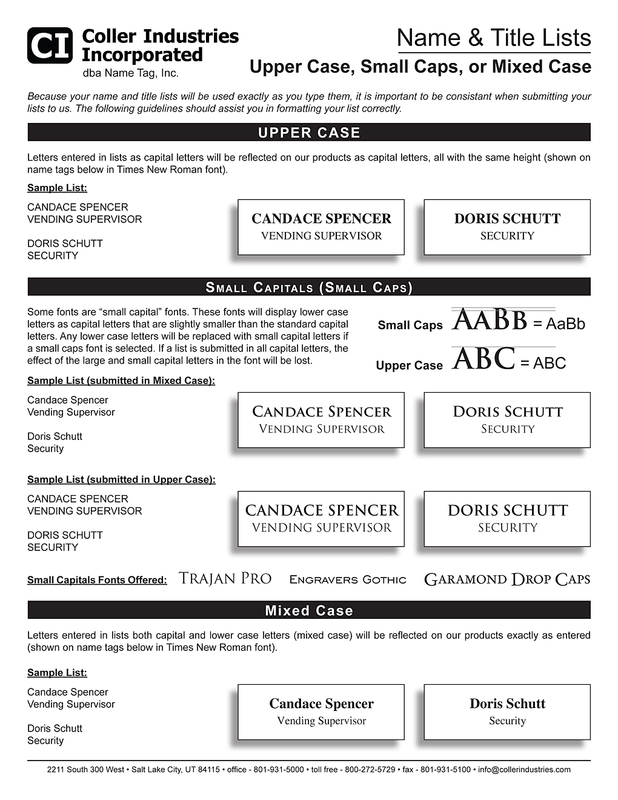 Please submit all names, titles, and other text for your order in digital form. We do not accept submissions via fax or verbally over the phone. Enter text exactly as you want it to appear on your product, including upper and lower case letters and punctuation. Your list must contain all text you want to be engraved. For duplicate tags, enter the text twice. Please make sure that you are proofreading your list carefully. 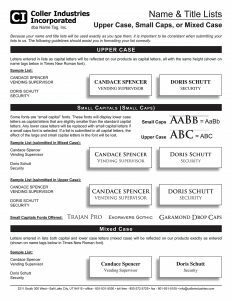 We use this list exactly as you submit it to print your name tags, so if there is a spelling error on your list, it will be printed that way! We will not edit your list. Lists not prepared to our specifications will be returned for correction, which may cause a delay in production. Information for each line of text must be provided just as it would appear on the tag/plate. If the layout has the first and last names “stacked” instead of on the same line, then the names will need to be submitted on different lines in your list. For tags with one line of text, enter information without leaving blank lines between tag information. If your tags have multiple lines of text, leave one blank line between each tag’s information. For duplicate tags, you must enter the text twice. If you don’t, we will only produce one tag! Remove all formatting (size, bold, etc.) from your list. You may enter a line of descriptive text into your list to separate groups with different features (fastener type, the number of lines, etc.). Hopefully, this clears up some things. We’d also like to cover the difference between uppercase, small caps and mixed case. Sometimes using capital letters on a name tag can get a little confusing. While most customers want mixed case on their name tags, occasionally we find some people want a variety. Here is what we offer. Because your name and title lists will be used exactly as you type them, it is important to be consistent when submitting your lists to us. The following guidelines should assist you in formatting your list correctly. Letters entered in lists as capital letters will show on our products as capital letters, all with the same height. Letters entered in lists using both capital and lower case letters, mixed case, will show on our products exactly as entered. Some fonts are small capital fonts. These fonts will display lower case letters as capital letters that are slightly shorter than the standard capital letters. All lower case letters show as small capital letters if you select a small caps font. If you submit your list in all capital letters, this effect will be lost. There will be more articles coming with even more definitions! Please help us by letting us know what definitions you need. Are there specific things you just don’t quite understand? Reply with anything with which you might need! And don’t forget that we have definitions for ribbons too! Next Next post: Merry Christmas from Our Desk To Yours!